Acting Defense Secretary Patrick Shanahan speaks with the media as he waits for the arrival of NATO Secretary General Jens Stoltenberg at the Pentagon, Jan. 28, 2019, in Washington. Acting U.S. Secretary of Defense Patrick Shanahan has recommended a new military service to handle space defense, dubbed the U.S. Space Force, will fall under the U.S. Air Force service branch. Shanahan revealed the organizational plan to reporters Tuesday, adding the new force would have a footprint that was "as small as possible." The option requires congressional approval, which could prove difficult with a Democratic-led House and a Republican-led Senate, but placing the new service within an already established service has bipartisan support in the House. Organizing the Space Force as a separate service within the Department of the Air Force would be similar to the U.S. Marine Corps, which is a separate service structured within the Department of the Navy. The Marine Corps has a top general to guide the military branch, but policy leadership falls under the Secretary of the Navy. It is unclear how President Donald Trump will react to the recommendation. Trump has repeatedly stressed that he wants a Space Force that is "separate, but equal" to the Air Force. U.S. President Donald Trump hosts a meeting of the National Space Council at the White House, June 18, 2018. In the meantime, the Pentagon is creating a U.S. Space Command, a move already directed by Congress, to better focus its defense of space assets. Shanahan said the Pentagon has selected an officer to lead the command, but would not elaborate. "I'm not going to mention the individual's name, but that that is moving its way through the process," he said. The U.S. military is organized into 10 combatant commands based on either geography, such as Indo-Pacific Command and European Command, or unified functions, such a Transportation Command and Cyber Command. This new, 11th combatant command would oversee space defense much like U.S. Cyber Command oversees cyber defense. Space Command is expected to start in mid-2019 with initial operation capability. 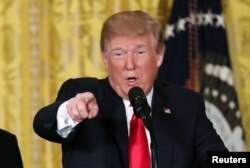 Officials familiar with Space Force deliberations have raised concerns to VOA that a new military branch could duplicate the work of the new combatant command. They say a separate military service may not be needed once the combatant command is fully operational. "You don't see a Cyber Force in addition to Cyber Command," one official said on condition of anonymity. The latest push to bolster space defense appears to align with the Pentagon's National Defense Strategy, which focuses on countering near-peer competitors Russia and China. 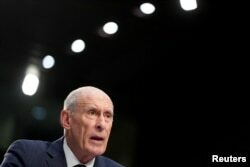 Director of National Intelligence Dan Coats warned Tuesday that China and Russia will continue training and equipping their military space forces while fielding new anti-satellite weapons. "Space has become the new global frontier," Coats said.